If you’re a Blogger or running any business website then you may know about Google Analytics and why is it best tool to track your Website traffic stats. Google Analytics has pretty simple user interface to track your website’s daily performances, though there are already ample of great traffic analytic tools in market like Histats.com and Amung.us. But Google Analytic is still stands at the top of them due to many reasons. I’m already using Google Analytics on all of my personal websites/blogs. But recently when I was working on one of my client’s website. It was some basic design renovation work on that site and after finishing it, I had to put Analytics tracking code again on the website. So I thought it’d be pretty easy to get Analytics code again for the website. I login to my client’s Analytic account and you won’t believe it was very annoying to find it out. It almost took me 30 minutes to finally find out tracking code. I know it sounds pretty easy to find out tracking code again from old analytic account but for some people or newbies its pretty annoying stuff to do. So today I’m going to guide you step by step process to get Google Analytics tracking code from your old Analytic account. 1. Login to your Analytic account. 2. After login, you’ll see this page – list of your all website associated with your analytic account. 5. 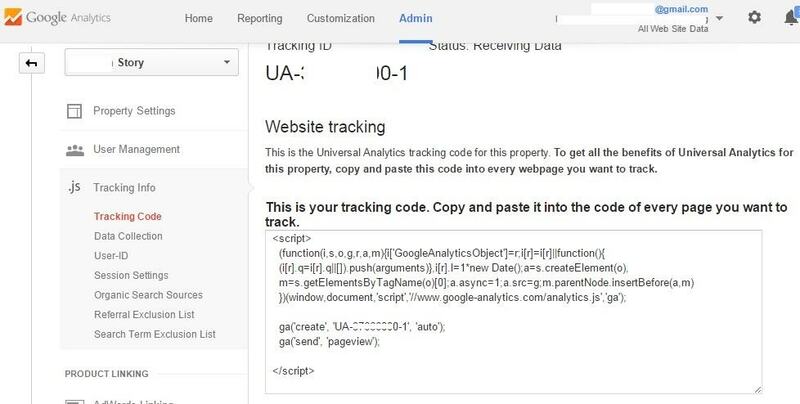 After clicking on “Tracking Code” you’ll redirected to new page and you can access your tracking code and put it on your website pages to activate Google Analytics on your website again. Just follow these easy steps and you’ll get your analytic code easily, I hope this posts works well for everyone.